In winter, the roller bearing of sawdust pellet machine is different from that in summer when it is replaced. Because of the lower temperature in winter, a lot of matters need to be paid attention to when replacing roller bearings in order to ensure that the roller bearings of pellet machine will not reduce the service life of bearings because of artificial operation. Today, GEMCO will explain to you the installation precautions of the roller bearing of the pellet machine in winter. When disassembling the roller bearing of the pellet machine, it is necessary to ensure that the installation surface and installation environment are clean to prevent environmental dust from affecting the installation. In addition, it is necessary to check whether the new bearings have foreign bodies such as burrs, iron chips, dust and so on. Otherwise, the bearings will generate noise and vibration during operation, and even damage the raceway and rolling body. Bearings must be cleaned before installation. Before leaving the factory, in order to protect the surface of raceway and rolling body from rust, anti-rust oil or anti-rust grease was injected between raceway and rolling body. Therefore, it is necessary to clean with clean gasoline and kerosene, and then coat with clean, high-quality or high-speed and high-temperature lubricants before they can be used. Cleanliness has a great influence on bearing life and vibration and noise. Choose the right grease. Lubricating grease is made of base oil, thickener and additives. The performance of greases of different kinds and different grades of the same kind differs greatly, and the allowable rotation limit is different. The performance of grease is also determined by base oil. Thickener is also related to the lubrication performance. The water resistance of the thickener determines the water resistance of the grease. Generally low viscosity base oil is suitable for low temperature and high speed, and high viscosity base oil is suitable for high temperature and high load. Different brands of grease can not be mixed. Even the same kind of thickener grease, the different additives will have a bad effect on each other. Because of the low temperature in winter, general bearings need to be heated before installation. The advantage of heating is that it can quickly, reliably and cleanly heat the bearing to the required temperature. Since only the inner ring is heated and the outer ring is less heated, it can be easily mounted on the axle and into the seat hole. The temperature of heating should be controlled well. 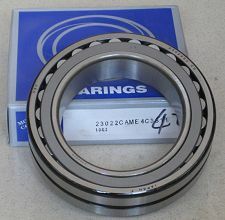 The bearing will be damaged if the temperature is too high. If the temperature is too low, the expansion of the ring is insufficient and the effect is not significant. Once the required heating temperature is reached, the installation should be carried out as soon as possible, so as not to cause installation difficulties due to cooling. Doing requires proficiency, speed and accuracy. Bearing also shrinks in the width direction when cooling, so it is necessary to exert certain pressure to tighten the inner ring to the shoulder during installation. After cooling, it is tested with a very thin plug ruler to see whether there is a gap between the end face of the inner ring and the shoulder. After installation, the lubricating grease should be replenished in time, then the sealing cap should be covered, and the screw should be tightened, so the rollers of the sawdust pellet machine can be replaced.